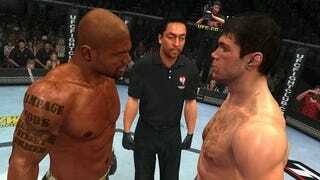 THQ's acclaimed UFC 2009 Undisputed is up for a Video Game Award, which make's Spike's broadcast this Saturday the perfect time to debut the mixed martial arts title's highly anticipated sequel. The awards show will feature the first ever gameplay footage of the UFC Undisputed 2010, plus commentary from top UFC fighters. A news release from THQ says "the footage will be introduced through a special UFC guest appearance." I just hope it's not a scripted bout with whomever's presenting. Following is a teaser trailer that went up earlier today; it doesn't give up much of anything to expect in UFC Undisputed 2010.